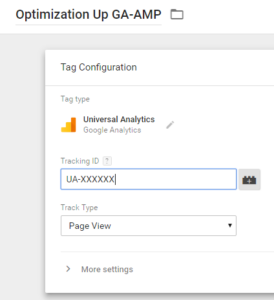 In this post, we will learn how to implement Google Analytics for accelerated mobile page either through Google tag manager or by placing the snippet directly on your pages (Hard-coded). 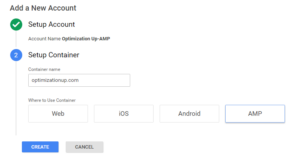 Google recommends to use a separate property id to track AMP traffic, this is due to the fact that amp-analytics measures things differently than analytics.js. This doesn’t mean that you can’t keep using the same web property for your accelerated mobile pages. 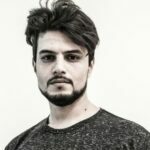 Actually, it will make more sense to many of us to keep using the same web property, but this will require different configuration by creating a content grouping in your web property in order to be able to compare accelerated mobile pages performance vs non-accelerated mobile pages performance. To integrate Google tag manager on accelerated mobile pages, you need to create a new container dedicated for AMPs. Then, at the beginning of the <body> tag, insert the element that has your GTM container ID. The container ID GTM-XXXXX should be replaced with a real container ID that you own in the code snippet above and rest of the document. Now, you can navigate to your GTM and add Google Analytics property ID to fire on all accelerated mobile pages. The property ID UA-XXXXX-Y should be replaced with a real property ID that you own in the code snippet above and rest of the document. If you have decided to keep using the same web property for your accelerated mobile pages, you can review the performance for your accelerated mobile pages vs non-accelerated mobile pages through content groups or segments. You most probably have structured all of your accelerated mobile pages to have the attribute /amp/ either at the beginning or at the end of your URLS. 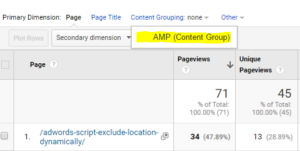 This will help us to assign content via a rule set and group all pages contain in /amp/ in one content group. 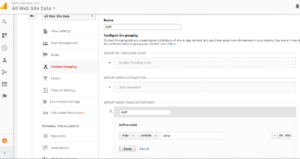 To open the rules editor, click Create a rule set under Group using rule definitions and set to “Page Contains /amp/. 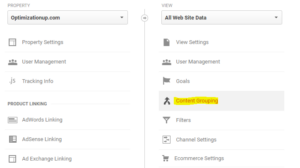 Once you save your content grouping, you will be able to review the performance of your group either through a primary or a secondary dimension. Segments are subsets of your analytics data that allow you to isolate and examine different data sets separately. You will need to add new segments for both accelerated mobile pages and non-accelerated mobile pages. Once you save and apply your segments, all your analytics reports will be updated to include the segments you selected. Very interesting article, I would have some questions when you are back 😊 Thank you!